All day $75 Amazon e-Gift card SWAG Saturday! I just love Chase. Thanks to Ultimate Rewards (UR) points I will be spending my Saturday diving again today with the Tortuga Divers that is the east end gang at Red Sail Sports here on Grand Cayman. One of the ways Lisa & I both rack up 30,000 points each (you can send UR points to those in the same household – very nice) is via our Chase Freedom cards. Not only is getting 5x points each quarter a no-brainier but also very helpful. Gas stations for example. I am sure you have noticed gas is not cheap. Why not lock in 5% off by getting gift cards at your favorite gas station? There are also clearly other ways to maximize the perks as well throughout the year. Either way, the current Freedom cards are VISA so if you had the MasterCard version you are eligible for the 20,000 new card bonus points after spending just $500 in the first 3 months of opening the account! On to this week’s SWAG Saturday questions and such. As each and every week please take the time to peek at the rules HERE. 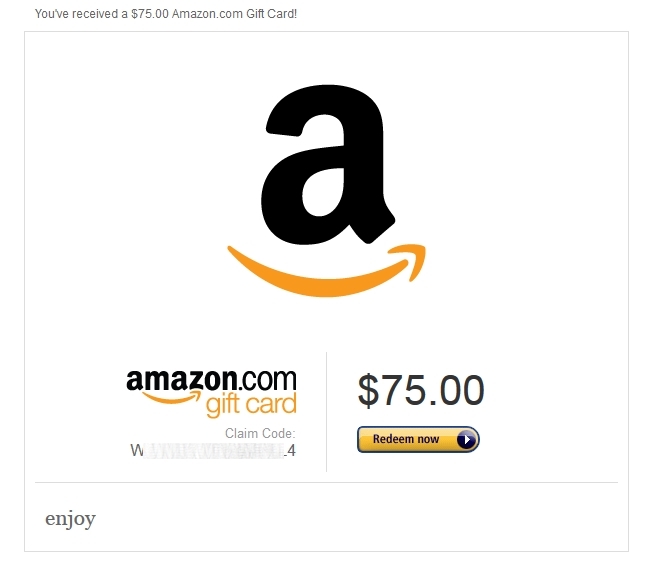 Next on to my question for a chance, via Random.org, to win the $75 Amazon e-Gift card. EDIT: The winner will be picked Monday eve 12/16 this week! I obtained a Visa Chase Freedom a few months ago. Never had it before, signed up with $100 bonus, but sent secure message checking on eligibility for $200 bonus when it came out. Received the extra 10k UR points within 3 hours. Unfortunately, I’ve never gotten a Freedom card. I might get one next year though. I have three Freedom cards: two Visas and one MasterCard. I’ve had two for at least 6-7 years. I don’t remember the sign-up bonuses or if there even were any. The third I got this summer when I downgraded my CSP. I’m fine with giving up a couple as leverage for new Chase cards but so far I’ve been approved for everything without having to. I do not have a Freedom card, but it is something that I am looking into for the future. I have the freedom visa. No plans to get another. I did not downgrade from the sapphire. I’ve had a Freedom card for a little over a year now – it’s the Visa one and came with a 10,000 point bonus. I applied for the Chase Freedom card and got approved, but there was NOT a bonus of 20,000 points. But by the time I got the card, Chase was offering the bonus. So I called Chase and told them I had not even used the card yet and can I still get the bonus? It took 3 phone calls and 30 minutes, but I got the bonus! Sorry, no help here but may need to look into it. Need a free card! So far the only Chase card I’ve gotten has been the Ink MC during the 60K offer to open earlier this year. I’m thinking about canceling before getting hit with the annual fee (I have other business cards, so I really don’t NEED this one), then applying for the Sapphire Preferred. I really haven’t considered the Freedom card seriously up until now…. I don’t have a Freedom card, but am considering getting one. I already have 4 other chase cards, so that is my only hesitation about getting another. My wife has the MC Freedom which I’m an AU on. We’re in the process of buying a new home so once this is over and if the 20k bonus is still around, I’ll get my own Freedom. I have a freedom for the 5x but disappointed drug stores aren’t eligible anytime next year. I don’t have one yet. Will definitely get one next year for sure. I have the visa version. Have a Freedom. Wish there was a drugstore category in 2014. I have never had the freedom card, but I sure do love the Ultimate Rewards points from my INK! Unfortunately, I do not have this card yet. I’ve been opening too many chase cards lately….I’ve got to lay low for awhile. Do not have this card at the moment but will get on my next Churn! I have the MasterCard version and have had it some time (it was converted to freedom when a different card was discontinued). I love the 5x UR bonuses. I have the Freedom Mastercard. My favorite cateogry bonus is drugstores. It seems most cards have gotten rid of the bonus for this category though. I have had the freedom card for 3 years now, love the 5% bonuses!. I have the visa one don’t know much about the MasterCard version. I have the Freedom visa. I also have the CSP. When the Freedom visa had the card stolen (dropped in a store by my teen) they did send it overnight, I think because I have the CSP. I don’t have this card, but it’s in my plans for 2014. I have never had a Chase Freedom card. I should get one to pair with my Sapphire Preferred, but I’m afraid of getting too many cards from Chase. I’m deciding between the Freedom and the IHG. I’ve only been getting cards for the last year so no Freedom cards yet for me. Anyway, you’d need to get the CSP first to be able to transfer to UR points so it’s really a waste to apply for a Freedom card before I have one of those. I have had the Chase Freedom Visa for about six months and got the $100 bonus for signing up. The 5% categories have been useful. I’ve just had trouble maxing them out so gift cards may be next. Next year’s categories look equally good. Is this the card with Alec Baldwin? Winning…..no…wait..Chase is Morgan Freeman, sometimes? Unfortunately, I don’t have this Chase card. I have many Chase cards……..INK is my go-to card. Never Had a chase UR card of any variety but plan to get one. Have had the chase southwest cards though in order to get the southwest companion pass. Don’t have plans for this card right now, sorry! I have several other Chase cards, but none of them are the Freedom. I downgraded my Sapphire preferred to plain Sapphire. I will likely apply for the Freedom, can’t hurt! Have the Chase Freedom Visa version which is great, but I have not tried downgrading as you mention. I’m new to this party. Just got my Chase Ink Bold card and I’m learning the ins and outs of reward points. I have a few airline loyalty cards to apply for first, then I’ll look into the Chase Freedom Card. I’ve never applied for the Freedom card, but do have the Sapphire and Ink Bold. I already have so many cards from Chase that I’m hesitant to apply for this one. I’ve had one in past but was told when I apples earlier this year(18 months after cancel) that they wouldn’t approve me again. I had the MasterCard and was applying for the same. I’ve never gotten a Freedom card, but plan to get one on my next app-o-rama. Got Chase Freedom Visa in Nov/13. Looking forward to transferring 20000 UR pts to my CSP. Did not downgrade. Plan on maxing out each quarterly spend next year. I have never had the Freedom card, but it sounds like I should try and get one this year. I’ve looked at the Freedom card, but haven’t pulled the trigger yet. I currently have the Freedom MasterCard version. I plan to sign up for freedom in the next year or so. Then I can comfortably phase out sapphire when I don’t feel like dealing with the fee. Does freedom have any year end points dividends a la sapphire? I’ve never had a Freedom Card. Thanks for telling us about them. Maybe I will get one. I do not have one but hope to get it next year. I do not have the freedom as I am at the max with chase now. I will be closing airtran soon, and swap for freedom. Don’t have a Chase Freedom card. Perhaps in 2014 I’ll look at the Chase Freedom to earn more UR. I do agree that UR are extremely valuable (even with the UA deval).. I have been eyeing this card but am moving soon so not card churning for a bit. While it may not have the flashy perks similar to an Amex Plat, it does have its own quality benfits. I’ve never had a Freeedom and my husband is completing the CSP minimum spend. I do like the bonus categories though. I downgraded from a Sapphire card. Have the Freedom Visa, have not tried to sign up again for the bonus. I’ve never had a Freedom card, but I am interested in getting one. I’ve never had one but may have to reconsider. Unfortunately I do not yet have a Freedom card. I currently have one Freedom card, and I got it as part of the 10-For-10 program where every usage gives me 10 points and 10% dividend. It is the Visa one. I also have the Chase Sapphire Preferred card. I’ve had freedom cardsincebefore I was a points collector. visa version,but Idon’t remember thesignup bonus! I have never had a chase freedom and don’t plan on it. Maybe get another Sapphire for my spouse so we can combine points in UR. In 2011 I was not able to downgrade my CSP to freedom. I’ve had a Freedom card for 3 year now – it’s the Visa one and came with a 10,000 point bonus. Yet to get a freedom card. But it’s on the list! I got the Chase Freedom Visa last month and just met my minimum spend for 20,000 points. Still using for Amazon this month to do my part to spend and help the economy. I currently have the Visa version of the Chase Freedom Card. I have a Sapphire and was thinking of downgrading to the Freedom. I might not do that anymore until others chime in. I have the Chase Freedom Visa. It is one of my oldest cards, it was originally the Chase Perfectcard Visa. They discontinued that product and switched everyone to the Freedom. I recently paired it with an Ink Bold since I didn’t have any of the premium Ultimate Rewards cards. I have the Visa version but plan to get the Mastercard once I’ve run the gauntlet of good Chase offers. Just a warning: for those downgrading a Sapphire Preferred to a Freedom remember that you can’t transfer points without at least one Ultimate Rewards card. Don’t get stuck with a stockpile of 1 CPPs! I don’t have a freedom card because its bonus seems lower than other card offers. That said, I have not ruled out applying for it much later in the future. No Freedom card for me. And, unrelated, stay clear of that shark! I do not have a Freedom card, but but it’s in my plans for 2014. I’m an AU on my wife’s Freedom account. Interestingly, this card started as a First USA Visa, then became a BankOne card after they got acquired, and finally a Chase card. We use it to max out the 5x categories each quarter. I’ve had the Freedom MasterCard for a long time, and I sure hope they don’t downgrade it to a visa, because there are some places that only take MasterCard. The Ink switch still annoys me once in a while, although if it means I could get the CSP sign up bonus again, I’d be happy. Just have the Sapphire Preferred and quite content. I currently don’t have the Freedom card but I might get one maybe some time in 2014. I have the Sapphire Preferred. I applied for the Ink Plus and got declined so I probably won’t be downgrading. I have the Visa version of the card. Got it a while ago with a cash bonus prior to me really start collecting Ultimate Reweards. If I recall I got a cash bonus when I got the card. I do not have a Freedom card, but it is something that I hope to get in the future. I have the Freedom Visa card and I have no plans to get another one. I have the visa version for a few years now. Never had the mastercard version but still deciding whether I should downgrade my CSP to another Freedom or go with the no annual fee Sapphire since I do dine out a lot during business travels. I’ve recently opened a couple of Chase cards so going to wait a bit before applying, but Chase Freedom is on the short list! No help here. I’ve not had this card and have no plans to obtain it. I have the freedom for at least two years now, visa version. Planning on having my wife sign up for one too. I do not have the card and I don’t plan on getting it. Thinking about applying for one now. I don’t have it yet, but the current increased bonus is tempting me. I just applied for the freedom card. Hopefully it comes so I can max out the amazon spending this quarter! I don’t have a Freedom Card or had one in the past. I don’t plan to get one. I got the Visa version of the Freedom about 4 years ago. Got a bonus then (can’t remember how much) and have held it ever since. Thanks for the tip on the new card version! I have the sapphire and freedom. Never used the cards like I should but will this year. Don’t have the card but am following the discussion. I do not have this card. Thanks for yoru blog and for keeping us posted on the best options as frequent travellers! I do not have this card, but I am following the discussion. I had sapphire PDF a couple years back and just recently got the freedom visa under the new offer. Still working on my $500 spend to get my 20k points. Never had one but they sound interesting! I’ve had the Chase Freedom visa for probably 6-8 years (I honestly cannot remember exactly when I got it). This is one of my oldest cards so I keep it around as it helps with my length of credit history. I love the card and it’s 5x bonuses. I haven’t ever had the CFC MasterCard, but since you mention it is possible to get the bonus on that one as well, I may wait until they are giving out MC ones again and try for that. As far as converting the Sapphire Preferred to the Freedom, it has crossed my mind as I’m debating what to do with my CSP card when the annual fee comes due. I’ll either downgrade it or try my hand at getting Chase to move most of my credit limit to my CFC before closing the card. I just got the Freedom card (my first) a few weeks ago. It was a card I had wanted for awhile but hadn’t gotten around to yet. As soon as I saw the 20,000 point offer, I jumped on it. I’m making as much use as I can of the 5x Amazon points for this quarter as I can. I have the Freedom Visa that I got just over 3 months ago. Just short of 90 days after I got the card, they raised the bonus to 20,000 ultimate rewards points. It took a few secure messages, but I did finally get Chase to match the offer. I have heard the same about downgrading the Sapphire Preferred to a Freedom. It may still be worth it to save a hard hit, but with the higher bonus now, it is definitely something to think about. My freedom card was a conversion from an old united mileage card , and it is a Visa card. While I didn’t get any sign up bonus ,it is worth to get all the cash back and turn to UR pts. My wife and I just got the chase freedom when the bonus went up to $200. Never had it before. I’ve never gotten a Freedom card. I am cheap guy and have the no annual fee Sapphire (not Preferred). Am contemplating adding possibly the Freedom (would do VISA since mist other cards I have are MC) or the Amex Reserve. unless the other airlines follow united I will not be building more chase points. An older (and far better) Chase card I had went through various name a reward changes and eventually morphed into a Freedom Card. Even with the bonuses the card is not used too often since it usually duplicates other bonuses and I can’t afford to max them all out. Haven’t had one, but need to get a new mastercard, so will check it out. No Chase Freedom cards yet! I don’t have the Chase Freedom card, but I do have the Sapphire Preferred card. Rene, I have the Chase MasterCard. Love the points you can rack and use it to buy all four family members gas. Also have Sapphire for major purchases. I just got it for the first time a week ago, VISA. I find the Chase rewards to be the best value when you transfer points to the airline rather than using them directly with UR even with the 20% off , transferring has been the better value. Although this summer I was able to snag a great deal on a flight to an out island in the Bahamas over Christmas. Couldn’t do that on miles. Thanks for all the info on your blog! I received chase visa, signed up with the bonus and already have 20k points in the account! I have never had a chase freedom card. I do currently have the sapphire card and have considered downgrading. I probably won’t do it in 2014 but may in 2015. I have the Chase Freedom Visa card and put 30,000 pts. on it every year. I intend to apply for the M/C on my next churn, and have noted that I will apply through your site. A word of caution to users: I bought $1,500 worth of Amazon cards, and transferred it to my Amazon account, thinking that I could then transfer it out of the account via Amazon payments. That doesn’t work, so guess I’ll have to buy a LOT on Amazon. I don’t have the card yet and will look at it later. much later. can hardly close my purse now and points are too scattered. after I collect my thoughts and maybe consolidate and use some ever dwindling worth points I will surely consider. I got my Chase Freedom Visa a few months ago with the $100 offer. I got it for the 5%cash back categories. When I saw it was increased to $200, I SM Chase and received the extra $100 bonus. I’m reading all the blogs and am hooked on this hobby. Just got the CSP and will have enough points to go on a vacation next year. Thanks to Chase and UR! I don’t have that card; may have to look into it. Not had one, but want one! I currently have the VISA version of the Chase Freedom. I’ve had it since I think 2010, and I don’t plan to cycle it because I want to maintain the credit history with the card. Never had the MasterCard version. I also have the Chase Sapphire Preferred, which I do not plan to downgrade or cancel because it is one of my favorite cards and both cards pair well together. I’m considering getting the card w my next turn. Chase would not let me downgrade to a freedom card just the regular sapphire card. I have the Chase Freedom card. Think I received a 20k bonus. Like the cashback but wish more categories offered larger cashback percentage. I have not gotten any of the Chase cards yet. Thinking about it though. I got the Chase Visa freedom card a little over a year ago back when they were offering the 30k bonus after minimum spend. Would love to get a mastercard one as well to fully take advantage of 5x quarterly bonus categories! I do not have the freedom card. I may consider applying for it in the near future. No I do not have one. Two credit cards are enough for me to manage. Glad that you can use them for points. I have never had one. Have a good time diving! I don’t currently have a Chase Freedom card. I have the Chase Hyatt Visa, but will be adding a Chase card next year. Don’t forget, if you downgrade to the Freedom you can not transfer points in the same manner as Ultimate Rewards points do. Dont have the Freedom card and not really interested in it now as I just picked up the Alaska Air card and 50K miles and am waiting for the final word on the Barclaycard Arrival. Have one, got it about 6 months ago. It’s a MC. I also have CSP, did not downgrade. I have a Chase Freedom Visa. First Rewards credit card I ever got! I don’t have one, but am considering one for next year. I have never had the Freedom card. I am thinking about simply asking for one of my Chase cards to be converted. I’d miss out on the sign-up bonus, so I’m weighing to see if the quarterly 5x bonuses are worth the switch. I do not have this card because the signup bonus has not been enticing enough to jump on it. 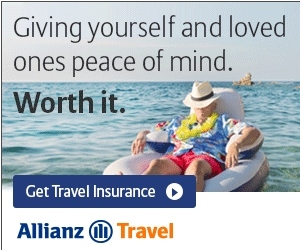 I’ve seen better values with Chase’s airline branded cards and the Sapphire. Once I close some accounts and other offers dry up, I’m sure this will be higher on my priority list. I don’t have it, yet. Hi. Its snowing here in NYC, so guess what I’m doing? I’m buying Amazon Gift cards with my Chase Freedom Visa card for my doormen – as I want to take advantage of the category bonus for Amazon. Most of Chase’s other cards, I’ve flipped back and forth between Visa and Mastercard – it takes some finess and HUCA, but I’ve generally been successful. With the Chase Freedom, I only have the Visa. This card is not in my portfolio at this time. I don’t have one, but my wife does (I believe she has the MC version). Thanks to the free credit reporting tools from my Barclay Arrival, I’ll have some idea about when it’s safe to go for another round of cards and likely get one then. I’ve had both a Visa and MC version of the freedom for several years, so I’ve been making the most of the 5% categories x 2 for years. I got the Freedom Visa in early 2013, my wife the same. We missed out on the 20k signup, but we max out the cards’ 5% bonus every quarter. While 2 immediate family members have the Freedom Visa, I unfortunately do not! However, this 20k bonus is enticing me to get one perhaps as early as next year! The gas station gift card approach for maxing out the 5% does not work at my local Exxon or Sunoco stations, where insider purchases are not coded as Gas by Chase. I have the Chase Freedom Visa (just approved in the last month). Eligible for the 20k sign up bonus. I’ve never had a Freedom card, so I can’t comment on your dilemma. I have never had a Freedom or Signature card so am unable to provide feedback. I do not have a Freedom card but am thinking about getting one in 2014. I have the Chase Freedom (Visa) and now Sapphire cards. Going to get one in the wife’s name soon! I downgraded but haven’t tried another one yet. I have a Chase Freedom MC – it was converted by Chase from an old Chase Marathon gasoline MC when Marathon quit the program. 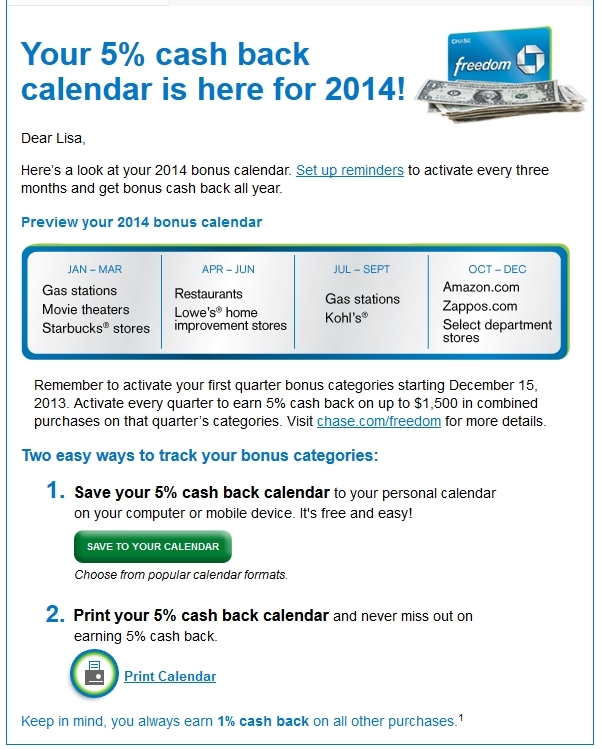 I used to get 5% rebates on Marathon purchases year round, now the rewards category varies by quarter all year. Still good rewards earning, but planning now required. It was so easy to earn good rebates on gasoline alone all year. Sorry, have never had one. Never had one, and don’t plan on getting one. I don’t have a Freedom card yet. Got a freedom in 2005 and had a 0% balance transfer offer. Moved my home equity loc to it to pay off over a year interest free. Have the visa and have had it ever since . Sat in the drawer until a couple years ago when I got a sapphire and chase checking account. I’ve never had a Freedom card. My main cards are my Delta Platinum AmEx, and a Capital One Venture VISA. Just got one on my latest churn. Running out of cards to apply for! I have the Visa version. I think this card is a keeper with no annual fees. I might get the MC version but I will hold off if I get see other offers that are in the $500 range. I don’t have a Freedom card, but I’m thinking about it for next year. I’ve gotten a little lazy on applying for new cards lately. I have the chase freedom visa. Love the 5x categories. I don’t have it yet but it is in my next AOR! My wife supervises all the app decisions in out household and she just got me the Chase Freedom. It is a Visa. Have both Sapphire and Freedom. Like the 5% quarterly bonus categories. Have Freedom and Sapphires. UR points great. I have the mastercard version but I want to get the visa version soon. I have the Chase Freedom Visa. It was converted to the Freedom from another card a long time ago, so I never got the signup bonus, but the quarterly bonuses more than make up for that loss. I don’t have a chase freedom card but it is on my list for my next round of applications. Planning to lose my citi business AA and my Barclay frontier, and possibly one other card. Have a chase united, the chase BA and a sapphire preferred. I only have th delta Amex and a generic MasterCard. May have to consider tha chase. I have had the Freedom Visa card for a number of years and love the 5x bonus categories each quarter. Don’t have the freedom card, but do have the CSP. I have had my Chase Freedom Visa since 2011. Thanks to blog advice I have added a Chase checking account and a Chase Sapphire Preferred Visa and most recently a Chase savings account. Feeling good about the whole Chase relationship. Don’t have the Chase Freedom card – been eying the Sapphire Preferred for a while for the UR points. Thanks for the Amazon giveaway and good luck to all! Sorry I don’t have one but I have learned by reading the responses. I got an older (and better — excellent cash back bonuses) Chase VISA in 1998 which was discontinued and eventually morphed into the Freedom card I have now. Unfortunately, I have no data points to help you, but I do have a question — in case you run across an answer: since my Freedom card was issued by Chase when they discontinued the older program I was under, am I eligible for a bonus if I apply for a new Freedom card without closing this old account? @HNM – you should be but Chase may want to know why you want both. I would love feedback on that as well as anyone who did a downgrade from CSP and did not have Freedom. I’ve never had either one! Never had Freedom (I have other Chase cards) but bonus categories are very appealing. Thinking of getting Freedom and Sapphire in teh future. Have had the Chase Freedom VISA for a couple of years. Love the 5x spending categories each quarter with no annual fee. Don’t have the Chase Freedom but hope to get one soon. I currently have the Chase Freedom Mastercard, but I might get the Chase Freedom Visa, and maybe even the Chase Sapphire. I’ve been holding back because I plan to get a home loan in a few years. I have never had the freedom card but am going to apply with my last applications of the year tomorrow. Never had the card. I’ll stick with my Delta card for now. Have never had either of these cards, but sounds like it would be good to get one next year. Have had the Chase Freedom for 20+ years of course I do not believe it was originally the Freedom back then. Got it in College and have always kept it. Now I did not know anything about the rotating 5% until this last year. I kinda forgot I even had this card. Been maxing out the 5% ever since. I just got the Chase Freedom VISA card recently. Loving the 5x bonus categories and no annual fee! Don’t have one, not planning on it in the near future. I do not have a Freedom card. My latest add is my Sapphire card and I look forward to using it while traveling – no foreign transaction fees. I have no experience with the Freedom Card so far. I would be interested to hear what you find from your analysis. I have just recently gotten a couple of cards for travel points and may look at others in the future. Don’t have the chase freedom but I hope do get one soon! I had the Freedom card long ago, it was a replacement card for one they discontinued. I closed it without ever understanding the benefits. I’m planning on getting a CSP card for the first time in the next few months. I don’t have one, but I’ve kicked around the idea of getting one! I love my Chase Freedom card! I use it all the time for the quarterly bonuses! The best part? No annual fee! Haven’t had one yet but have started to look into getting one. We have the VISA and try to take advantage of all of the 5x categories, then we transfer the UR points to my account since I have the Sapphire Preferred. I’ve never had a Freedom card. Just a chase UR card. Getting tired of chasing points. I have never had a Chase Freedom card, but I’ve been considering it lately. I am planning on looking into it more next year. I carry the Freedom Mastercard, since sometimes you get a bonus or special perks from Mastercard. Most of my other cards are Visa or Amex. I have the Freedom card and put a sticker on it with the eligible categories to help remember where I get 5x points! I have the Visa version of the Freedom card. I got it with the regular 10,000 point bonus. I have no plans to downgrade my Sapphire Preferred. I only use the Freedom for the bonus categories. This year I maxed out the first two quarters and not last quarter or this quarter. I wish 1st quarter 2014 included drugstores like last year. I have chase the freedom card for over 7 years. Its been a good card for me. Had the visa Freedom card for years now. Got in back in the day for 30,000 points sign up and additional 5,000 a few weeks later due to their trouble with UR mall. Those were the days, not these barely warm offers of late. Not currently a card carrying member, but will definitely check it out. I just got the chase freedom visa card in mail today! love to rack up those points! I have never had the Freedom card and do not have plans to get one. Thanks for the information. I have the Freedom casrd and the 5x bonus categories are great! I have the visa version of Freedom. I have never had a Sapphire Preferred card. I have both a Freedom Visa and MC. I’ve had the Visa forever – likely before anyone knew what a sign-up bonus was. It could even have been a converted card from a previous bank! The MC I got a few months ago by converting an old Slate card that was gathering dust. I did not get any bonus with that conversion. I converted to get a second card with 5X points. Really looking forward to six months of gas stations for Visa GC’s next year. Thank you for the giveaway! Have not had a reason to try it. New to the process and I don’t know how it is better or worse yet! Future might thou. I have the Chase Freedom Visa atm, love it! I don’t have one but am thinking if I should give it a try. Had one for a while. Love the points! Never had a freedom. But I have a Ink and Sapphire I have been happy with. I have the Visa version of the Freedom card that I got in addition to my Sapphire Preferred. Never had the freedom card mc or visa. On my list for the catagory bonus and the extra point now would be good too. I own the MasterCard Freedom card and was never given any bonus. I have used it for the past two years. I used the card quite often in 2012.This year(2013) the bonus categories were not as good. In 2013, I only used the Freedom card, for the bonus categories and averaged about $500 spend per quarter. I opened the Chase Ink/Bold cards in 2013 and am able to average a minimum of 7000-8000 points per month.I also downgraded my Sapphire Preferred Card in 2013 to the Sapphire card, which I rarely use. I added the United Club card in 2013 to replace the Sapphire Preferred benefits. Had the MC a long time ago. Cancelled it since I never used it. I think it’s time to get it again. I have the Freedom MasterCard. It was converted from a very much older version, so I didn’t get a signup bonus, but do love my quarterly bonuses! Nope, never had one. Would consider getting one next year. I do NOT have the Chase Freedom card yet, but I am considering getting it in 2014!!! Haven’t had the Freedom card, but thinking seriously about getting one given the current bonus. I have an Ink Bold and it’s got excellent rate but if I were to switch I think the freedom would be my choice. No Chase cards at present, but will probably go for the 20k point bonus. I’ve never had one but might consider getting one. I do not have the Chase Freedom, but I do have several other Chase products. Sadly, I don’t have a Freedom Card… next on the list though. Yeah, back in the day hubby got the Chase Freedom and received a $300 bonus plus no annual fee. He would have likely kept it forever but their security features were making it too time-consuming for me to pay the bills for him. I think this difficulty may be fixed, so we may consider getting one again. I don’t have one but will be considering an app this year. Love the flexibility of UR points. I have not had one. Considered it several times but always had other options that were better for me come application time. Was going to do it recently, but was highly underwhelmed by the category bonus list for 2014. My wife and I both got the freedom card this month with the $200 after $500 in spend offer. Both are cards are regular old visa. I picked up the Freedom Visa earlier this year. Obtained the Freedom Visa with the recent bump to 20,000 points. I got a Freedom Visa last April. It was my first. I got the Freedom Visa a few years ago when it was a 30,000 point sign up. Don’t have the Freedom yet, currently using my Discover for 5% in some categories. Looking forward to get the Freedom later! I have the Visa version of the Freedom card. It got converted over from a Circuit City card before they went out of business (at least as brick and mortar stores). Been loving the 5x categories. I do not have a Chase Freedom card. I DO have a Chase Sapphire Preferred which I’m happy with thus far. I have the Freedom MC and didn’t know I may be eligible for the 20k points bonus for getting the Visa card. Definitely going to sign up! Don’t have the Freedom. I have a Discover and use it for the 5% category bonuses. Perhaps I should try the Freedom since I also have the Sapphire and could move Freedom points into UR points.